That&apos;s why aboard Emerald Star it&apos;s a gym, complete with mirrors forward so the owner and guests can monitor their motions and, no doubt, heighten the feeling of working out in a serene setting, especially if the doors leading out to the beach platform are open. (Though the crew should be mindful of waves or wakes nearby: The proximity to the water could permit unwanted splashes down the two steps inside.) There&apos;s also a handy head tucked to starboard, so no one need venture up to the main deck to freshen up. Among the handful of 43s under construction at CRN&apos;s Ancona shipyard, one will feature a kids&apos; play area here, while another will have the area outfitted as an additional saloon where guests can relax and watch the sea. The two PWCs are the only watertoys stowed on the sundeck, leaving it mostly free for relaxation. Speaking of watching the sea, the owner has the best place of all to do so: a private terrace off the master suite. The first megayacht to launch with this feature was, not coincidentally, another CRN build, the 178-foot Ability. 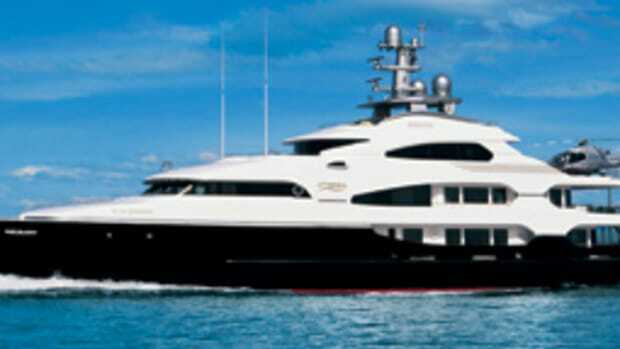 I liked it then, and I like it now, particularly considering this is the first "small" megayacht with one. Just as aboard Ability, mere steps from the bed, automatically opening, smoked-glass doors lead to an intimate, teak-decked spot with chairs and a table—ideal for enjoying a morning cup of coffee while you check out the harbor you&apos;ve just arrived in. 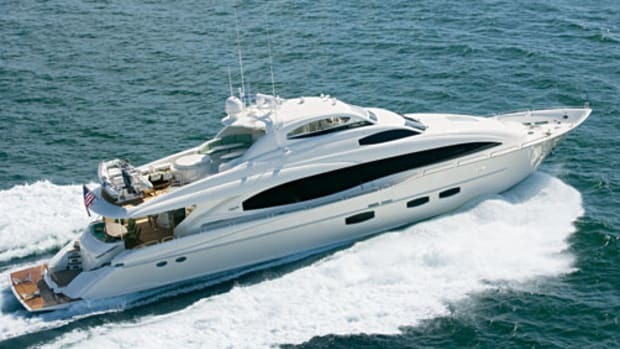 It&apos;s incorporated into the body of the yacht herself, instead of hanging off the side as it does on many yachts. 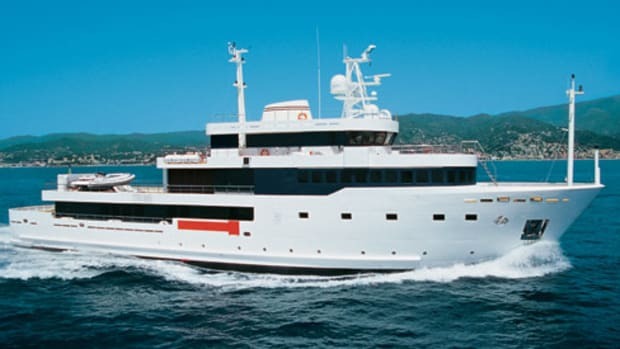 Also just as aboard Ability, Emerald Star&apos;s terrace has smoked-glass windows that can lift and lock overhead to allow breezes to circulate or remain down for privacy (and, of course, while at sea). 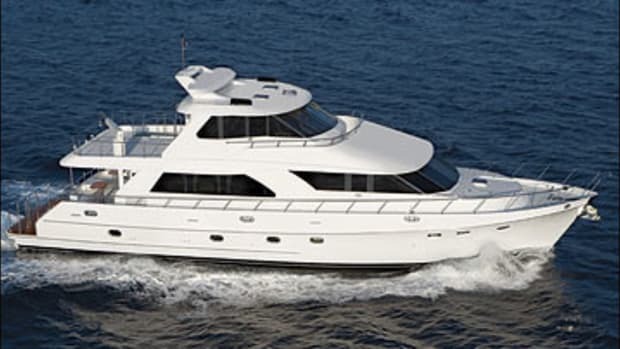 Since the CRN 43 series complies with MCA safety regulations, the windows were tested for durability. Even in areas arranged in a more conventional way, Emerald Star boasts features you wouldn&apos;t expect to find in this size range. Overall the sundeck is remarkably spacious, occupying more than 300 square feet and outfitted with a bar with stools, lounging spots, and sunpads each comfortably capable of accommodating two people. The head built into the mast up here is a welcome surprise, as is the rain-shower effect guests can get treated to just forward and to starboard of the bar, when they step out of the fully forward Jacuzzi tub. 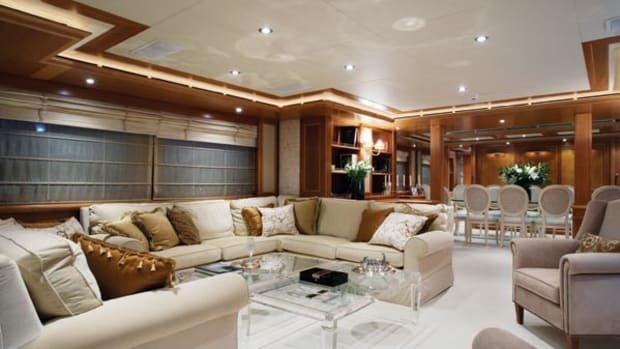 If they crave something more than what&apos;s cooking on the barbecue, a dumbwaiter to the main-deck galley brings it up—additionally benefitting the crew (ever tried carrying even a small tray up the stairs of a moving object?). And when&apos;s the last time you heard of a helicopter landing pad on a 141-footer? 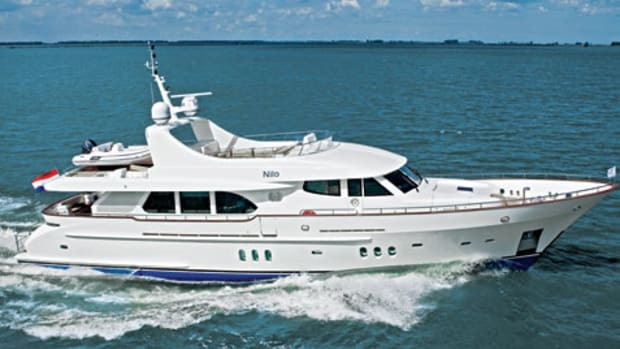 While Emerald Star isn&apos;t outfitted with one, the area where the owner&apos;s pair of PWCs sit, aft on the sundeck, can be reinforced for such a purpose at an owner&apos;s request. 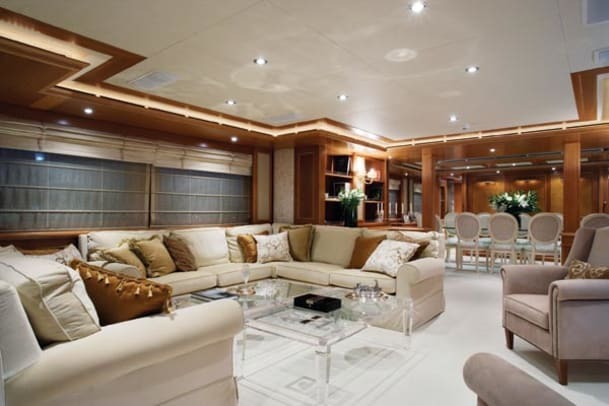 You wouldn&apos;t think there&apos;s much that can be done with a skylounge on a 43-meter, but CRN proves there&apos;s big room for improvement—literally. A pantry easily half again as large as those on similar yachts is concealed behind a door forward of the bar. The dumbwaiter to the sundeck can stop here, convenient for serving guests within the skylounge itself or seated at the shaded 12-person dining area just outside its doors. Should a crewmember want to quickly get more wine or realize something didn&apos;t come up on the dumbwaiter, a handy set of stairs leads down to the galley. And as for guest accommodations, Emerald Star proves that they, too, can be more voluminous than usual. Each of the four staterooms (three doubles and one twin outfitted with a Pullman berth) rival the size of the master stateroom aboard some 100-footers I&apos;ve seen. Burly men will be pleased to know the showers (marble, of course) are anything but claustrophobic, and even those guests who pack more suitcases than they have hands for won&apos;t have luggage underfoot. A walk-in locker (no crawlspace this) in the guest foyer handily accommodates several suitcases and additionally has shelves for smaller carry-ons. Speaking of carrying on, that&apos;s what about 400 guests comprised mostly of clients and dealers did last fall in Cannes when Emerald Star premiered at an invitation-only party. 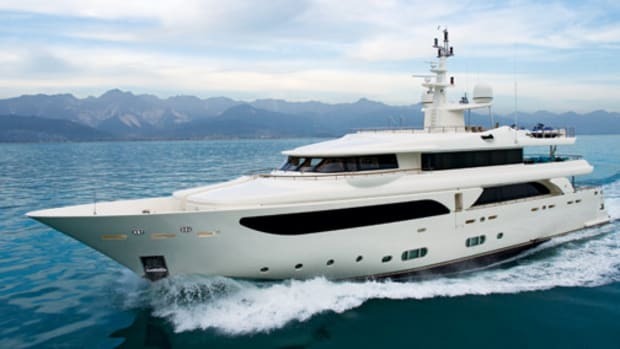 At that event CRN management announced that six yachts in the 43 series had been sold. Was it a sign that semicustom buyers are realizing they can and should have more than what&apos;s being offered elsewhere? Perhaps. Regardless, Emerald Star is turning their heads—and should turn those of the competition. 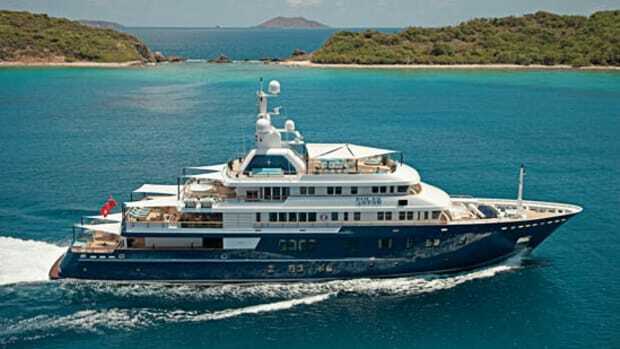 Some other yards may offer faster yachts—bulbous-bow-equipped, this lady reportedly cruises at 13 knots and tops out around 15.5 knots—but "small" megayachts shouldn&apos;t have to be small-minded when it comes to their features.